After a break for the November elections, the Advisory Council met on January 17th to meet the new secretary, Caleb Frostman, and review events of the last few months. The financial report was eye-popping and will be addressed in its own post. Here is what was covered outside of the financial report. Mike Myszewski reported on the Department’s efforts in preventing the mis-classification of employees. Note: These reports continue to be made orally and have NEVER appeared in writing. Given the Department’s annual report on alleged claimant fraud and the numerous charts and reports on alleged claimant fraud that appear at these meetings, it begs the question why the Department cannot at a minimum put down on paper in some way what it is doing to combat alleged employer unemployment fraud. In any case, given that this report consists entirely of what was said, some of my numbers may be off. In addition, the exact nature and scope of this data is unknown, as this data is simply not available to the public and the Advisory Council apparently does not ask for it. Mr. Myszewski reports that the Department has recovered $2.1 million in unemployment taxes from employers because of mis-classification for 1222 employees, or about $347 per mis-classified employee. This recovery arose from 511 investigations in the last fiscal year, and there had been 145 investigations so far in the current fiscal year. There were NO questions from the Advisory Council about this report. As compared to the public hearing in November 2016 in which there were 300+ comments from 295 individuals, at the 2018 public hearing there were only 21 comments in toto. Given these few comments, the summary presented to the council at this meeting included not only a summary but the actual 21 comments that were made. She is upset with: (1) having to wait 21 days for an adjudicator to be assigned to her case and (2) the extremely limited access to phone support when the number of unemployment claims are much less than what occurred in 2010, when she last filed for unemployment benefits. Upset with having to wait 21 days for a decision on her claim. The penalties for unemployment concealment are much too harsh. Get rid of work search requirements for employees who experience seasonal layoffs and return to the same employer and eliminate the waiting week. Get rid of work search requirements for employees who experience seasonal layoffs. Get rid of work search requirements for employees who experience seasonal layoffs. And, the claim-filing process is extremely difficult for the employees handling snow removal during the winter months. Get rid of work search requirements for employees who experience seasonal layoffs. For employers in Northern Wisconsin, work searches during winter months are a waste of time for both employees and employers, as there no jobs available then. Complaining about being denied benefits because a medical disability limits work availability. *Note: the description offered presents an obvious violation, as claimants are still eligible for unemployment benefits when work availability is limited to part-time work only because of a medical condition. See CITE. Undo the damage to the unemployment system created in DWD v. LIRC (Beres), 2018 WI 77, 382 Wis.2d 611, 914 N.W.2d 625, that allows an employer to discharge an employee for a single absence (regardless of why the employee was absent) as misconduct and end the work search requirements for employees who undergo seasonal layoffs and expect to return to the same employer. After presenting numerous ways to make job search information more user-friendly to claimants, she requests that job search criteria be expanded to include the actions claimants actually need to undertake when searching for a new job — such as networking events and informational interviews — and for the Department to allow training opportunities that currently prevent claimants from receiving any unemployment benefits. Because Act 370 codified current administrative rules and Department practices, claimants and employers should not expect any changes to the unemployment insurance program under this Act. So, Republican legislators have taken ownership of the job search requirements that nearly no one — I repeat, nearly no one, if the public comments in 2016 and again in 2018 are any indication — thinks are doing anything useful except to make unemployment claims more difficult. Everyone in rural Wisconsin should be asking their state representative and senator why — WHY — they think these job search requirements make sense. The Department indicated that its own proposed changes to unemployment law will be introduced at the February meeting of the Advisory Council (why the Department continues to introduce its own substantive changes to unemployment law remains a mystery ever since the Department proposed its own substantive changes to unemployment law in November 2012). Scott Manley of Wisconsin Manufacturers & Commerce also made two research requests. First, he wanted the Department to revisit its definition of independent contractor work in light of growing employment through TaskRabbit, Mechanical Turk, and other on-line business operations. Note: the Labor and Industry Review Commission has already determined that a Lyft driver is NOT an employee for the purpose of unemployment benefits. See Ebenhoe v. Lyft, Inc., UI Hearing No.16002409MD (20 Jan. 2017). Currently, Lyft’s responsibility for paying unemployment taxes is being litigated. See Lyft, Inc., UI Hearing Nos. S1500424MW and S1800091MW (26 Oct. 2018). Second, Mr. Manley wanted to know what the Department could do to expand its program integrity efforts for bringing criminal charges against claimants for their alleged unemployment fraud. For how the criminal charges that have already been filed are hugely disproportionate according to the race of claimants (75% of the cases are against African-Americans), see this post. Mark Reihl of the Carpenters made a third request. He wanted a comparison of how Wisconsin’s weekly benefit rate (the average received and the maximum available) compare to the other fifty states and territories. Note: Wisconsin’s maximum available weekly benefit rate is $370. The average weekly benefit being paid out in 2017 was $317.14. See this 2017 4Q report (this data is for all fifty states, Wisconsin is on p.64 of the pdf). Data for the 3Q of 2018 indicates that the average for the last four quarters was $320.03. The average duration of unemployment benefits for these last four quarters was 12.7 weeks. See p.63 of the pdf for this data. Data on the financing for all fifty states for 2017 (the most recent year available) can be found here (Wisconsin is on p.60 of the pdf). MADISON — Federal employees in Wisconsin can apply for unemployment benefits to help meet their financial needs while they wait for work to resume. Federal employees can apply for unemployment through DWD’s online UI benefit system at my.unemployment.wisconsin.gov. Because many federal offices are currently closed, furloughed workers should be prepared to provide wage verification in the form of pay stubs or a W-2 form as DWD may be unable to verify wages through the employer. Federal workers that are working full time but are not being paid during the partial shutdown are not eligible for unemployment benefits. There are more than 29,000 federal employees in Wisconsin. Per preliminary counts, DWD’s unemployment division fielded roughly 426 total initial and continued unemployment compensation claims between Jan. 7 and Jan. 11, 2019. As required by law, workers who receive back pay should plan to repay any unemployment benefits received. Several issues need pointing out, however. First, federal workers are finding it difficult to impossible to actually file unemployment claims. On-line claims (the only method allowed for filing an unemployment claim) are being rejected without an explanation that the worker understands. And, phone calls to get an explanation are limited to certain days of the week, and those days are connected to a worker’s social security number. Miss that day, and you have to wait several other days or maybe even a week to try again with a phone call. Note: For example, after two minutes of voice menu choices and prompts, I learn that I need to call back on Monday, Wednesday, or Friday, as Tuesday is not my designated day according to my social security number if I want to ask someone a question about the claims-filing process. Second, the on-line claims process (the last time I had access) does not contain a category for govt shutdown. These workers are not laid off. They have not been discharged either or let go for performance-related reasons. They could indicate that they are locked out, but I do not think that reporting category exists. And, the kind of questions being asked can lead to claims being summarily rejected. For instance, a federal worker could easily report he or she is still eligible for work with his or her federal agency. Answering yes to such a question would automatically mean no eligibility for unemployment benefits because the separation seems to be a voluntary quit by the employee. Third, given the Department’s eagerness to charge concealment for non-intentional claim-filing mistakes (including in 2018 alleged mistakes in reporting the reasons for the employee’s separation from employment). So, an employee might indicate he or she is laid off and start collecting benefits because of the shutdown. The Department may later conclude, however, that this layoff “reason” is incorrect and then charge the claimant with unemployment fraud for intentionally providing misleading information on his or her unemployment claim (and even when the mistake was actually unintentional). Note: for a full description of the unemployment concealment issue, see this expert report I prepared for a case of a claimant charged criminally for the kind of unemployment concealment allegations that the Labor and Industry Review Commission routinely dismisses. Fourth, any federal workers with second jobs, while still eligible for unemployment benefits, MUST make sure to report wages and hours from those second jobs. Under-reporting those numbers will automatically be considered by the Department to be fraudulent. So, any wages or hours from a second job should be OVER-reported to avoid a fraud charge down the road. Fifth, you will need to do four job searches a week and many other tasks to remain eligible for unemployment benefits. For how to handle those job searches and other unemployment filing matters, make sure to review these tips for filing unemployment claims in Wisconsin. Finally, when/if the shutdown ends and if/when missing wages are repaid, you will need to immediately contact the Department about re-paying unemployment benefits. If you wait for the Department to contact you, expect to be charged for unemployment concealment. So, as repeatedly said here, unemployment is purposefully difficult to impossible to receive and everyone should avoid unemployment benefits unless you have no other options. The on-line system is designed for the benefit of the Department — not you — as a way to catch a mistake on your part. As obvious, these hoops and obstacles for filing unemployment claims are part of a larger economic change underway in this state the past several years. Until there are significant changes in the unemployment system in Wisconsin, you need to be as careful as possible and understand that the Department is always looking for a reason to disqualify you or charge you with concealment if you do end up receiving unemployment benefits. UPDATE (17 Jan. 2019): Another problem appears for federal employees — having the wages to qualify for unemployment benefits in the first place. Because of the shutdown, federal agencies are not responding to inquiries from state unemployment agencies about verifying employees’ wages. As a result, employees need to produce pay stubs going back a year or more to establish the wages paid out for various quarters. The catch: access to the pay stubs is usually only available to employees when at work using their computers. WASHINGTON, DC – Today, Ways & Means Committee Chairman Richard Neal (D-MA) sent a letter to Department of Labor (DOL) Secretary Alexander Acosta calling for guidance to be issued that would ensure that states can provide federal workers not being paid during the government shutdown with Unemployment Insurance (UI) benefits. Roughly 800,000 federal workers are furloughed without pay due to the shutdown, and President Trump has stated that this impasse could persist for many more months. Unemployment Insurance would help furloughed workers make ends meet and pay for necessities as the shutdown continues. As obvious from this press release, the Dep’t of Labor is simply dropping the ball on a host of issues and so adding additional hurdles for federal employees trying to claim unemployment benefits when out of work through no fault of their own. UPDATE (23 Jan. 2019): For more information about the problems federal workers are having in filing their unemployment claims and actions states can do to ease that claim-filing, see this posting by Andrew Steiner of The Century Foundation. Note: There is typo in the article. The governors who want the federal govt to pass legislation to allow unemployed federal workers to receive unemployment benefits even when called back to work for no pay are from Michigan, New York and Washington, not Wisconsin. After the Supreme Court decision in Operton v. LIRC, 2017 WI 46, and an appeals court decision in Easterling v. LIRC, 2017 WI App 18, the Department of Workforce Development took no action to change its practices and follow these binding court decisions. Accordingly, parties needed to appeal their initial determinations in order to get unemployment law to be followed. The stated reasons for discharge were allegations that there were receiving issues on three separate dates in January of 2018. The store’s witness said he was only familiar with the incident that occurred on January 13th. The employer must prove the allegations upon which the discharge was based. Standing alone, this court does not believe that the January 13th incident [concerning a document mis-match between inventory and an invoice] is substantial evidence of substantial fault. The plaintiff stated that she believed two pieces of paper merely stuck together and that is the reason the invoice was not scanned properly. She realized on the same day that an invoice could not be matched to the inventory and the [employer] witness (Ovsak) said she came to him and explained the problem. Apparently the problem was resolved when they received another invoice from the supplier on the following Monday. There is no argument or claim that the plaintiff did anything intentionally wrong. In fact, she discovered her error and reported it to her supervisor. It appears that the incident was an inconvenience for the employer, but nothing more. The Commission agreed with the ALJ that the employee’s conduct did not rise to the level of an intentional and substantial disregard of the employer’s interest. There is no evidence that this single act was anything but an inadvertent error. The Commission modified the decision to of the ALJ to fit the conclusion the ALJ wanted to reach. It decided that the January 13th incident, along with three prior coaching incidents during the second half of the fall of 2017, served as the reasons for discharge. Specifically, leaving a receiving door unlocked in August of 2017, an alleged incident of being belligerent and speaking with a raised voice on November 9th, and failing to accurately count some DVD’s on November 22th. The plaintiff says those earlier coachings are not relevant in determining whether the discharge after those coachings was for substantial fault where the employer has failed to prove the subsequent allegations that actually prompted the discharge. The employer offered no proof at all of two of the three grounds alleged in the discharge document. While it offered proof that the January 13th, 2018 incident occurred, that act in the opinion of this court was not evidence of substantial fault. The Wisconsin Supreme Court has ruled that careless conduct does not equal substantial fault. Operton v. LIRC, 2017 WI 46, 375 Wis.2d 1. The Commission relied on the prior coachings in 2017 as well as the January 13th incident to justify the finding of substantial fault. . . . the mere fact that [the Commission] did indicates that the Commission felt it necessary to essentially correct and bolster the findings of the ALJ in order to try and justify denying the plaintiff benefits. Those prior coachings appear to be unrelated to the action on January 13th. They appear to be minor infractions and they did not lead to a dismissal standing on their own. The Commission cannot create evidence of substantial fault by adding the prior unrelated coachings to the January 13th incident. So, now not only is DWD ignoring Operton, but administrative law judges at the Department’s hearing offices are also ignoring Operton. And, the Commission is also now ignoring Operton and seeking to get around Operton by adding arguments and connecting evidence in ways that the record obviously does not support. The Department and the Commission are supposed to be NEUTRAL entities that are supposed to assess the evidence presented by employers to meet their heavy burden of persuasion in order to disqualify a claimant from receiving unemployment benefits when misconduct or substantial fault have occurred. What this case illustrates is that the Department, the hearing offices, and the Commission are ignoring these obligations and instead looking to disqualify claimants on nothing more than whim and pretense, even when courts have directly told them otherwise. Given the hundreds to thousands of people who apply for unemployment benefits every week in Wisconsin, it should in NO way require an attorney well-versed in the intricacies of unemployment law take an appeal into court simply so that unemployment law might be followed. An initial determination, a hearing before an administrative law judge, and an appeal to the Commission all failed in this case to follow clear and unmistakable black letter unemployment law. An employee having to take up an appeal to circuit court and find an attorney for that appeal for the sake of simple justice in an unemployment case is in practical terms not possible for the hundreds and thousands seeking unemployment benefits every week of the year in Wisconsin. Something is fundamentally wrong when claimants have to go to such lengths simply to get the unemployment benefits due them if the law had been followed in the first place. Note: Links to the appeal tribunal and LIRC decisions will be added. Matthew Yglesias has some news about the latest in labor market research. Those who were applying for jobs and having to go through three to five rounds of interviews and be an absolutely perfect “fit” for the job already know the answer: the skills gap is more myth than reality. employers responded to high unemployment [during the recession] by making their job descriptions more stringent. When unemployment went down thanks to the demand-side recovery, suddenly employers got more relaxed again. What folks need to start paying attention too, however, is how national job numbers are covering up a TON of variation from state to state. The job market in Minnesota is today nothing like the job market in Wisconsin. And, as indicated previously, changes in denial rates across the fifty states vary dramatically and have changed significantly in numerous states since 2010 because of an explosion in use of “other reasons” to deny unemployment benefits to claimants. So, as always, in Wisconsin make sure to review these tips for filing an unemployment claim. What is happening with FoxConn? With the end of 2018 approaching, the first measures for the FoxConn deal are coming into play. Note: A tip of the hat to PixelEnvy for a post about the effect of FoxConn on Mount Pleasant and links to some of the examination discussed below. Recall that, for $3 billion in direct transfers and around another $1.5 billion in infrastructure and other improvements, FoxConn promised to build a cutting edge LCD display manufacturing facility that could someday employ up to 13,000 people at an average (not a median wage) of $53,875. Note: Here is the first flyer about FoxConn. The number and size of all the incentives makes it impossible to find a single document that describes them all. For starters, here is a rundown of the direct financing contained in the FoxConn legislation, and here is a description of the transportation funding for FoxConn. My thanks to the Wheeler Report for first posting these documents and others. Note: The distinction between average and median is important. Of the following numbers — 10, 10, 100, 100, 100,000, 100,000, 100,000 — there is a median of 100 and an average of 42,888. That is quite the difference. There is an amazing podcast from the folks at Reply All about Mount Pleasant and FoxConn. And, there is an article in the Verge with reporters from Reply All and others about how FoxConn came to be in Mount Pleasant. What comes across over and over again in these reports is how negotiations behind closed-doors and astro-turfing served to push an agenda that very few seem to want. With all the lame duck shenanigans of late in Wisconsin and other states, it seems that this FoxConn deal was just more of the same: a lot of promise, few to no details, and the great likelihood that reality will not match up at all with what was promised. Ex.A of FoxConn-WEDC contract. Notice that FoxConn qualifies for these credits if it has just 260 employees on payroll by the end of 2018. At the end of 2019, the minimum threshold doubles to 520 employees. Note: these low numbers make sense in light of reports that the factory will not be operational until 2020 at the earliest. As under the enterprise zone program, “full-time employee” would mean an individual who is employed in a regular, nonseasonal job and who, as a condition of employment, is required to work at least 2,080 hours per year, including paid leave and holidays. However, WEDC could grant exceptions to the requirement that a full-time employee means an individual who, as a condition of employment, is required to work at least 2,080 hours per year if: (a) the individual is employed in a job for which the annual pay is more than the amount determined by multiplying 2,080 by 150% of the federal minimum wage ($22,620); and (b) the individual is offered retirement, health, and other benefits that are equivalent to the retirement, health, and other benefits offered to an individual who is required to work at least 2,080 hours per year. a. Determine the zone payroll for the taxable year for full-time employees whose annual wages are greater than the amount determined by multiplying 2,080 by 150% of the federal minimum wage ($22,620) in a tier I county or municipality or greater than $30,000 in a tier II county or municipality. b. Multiply the amount determined under “a” by 17%. 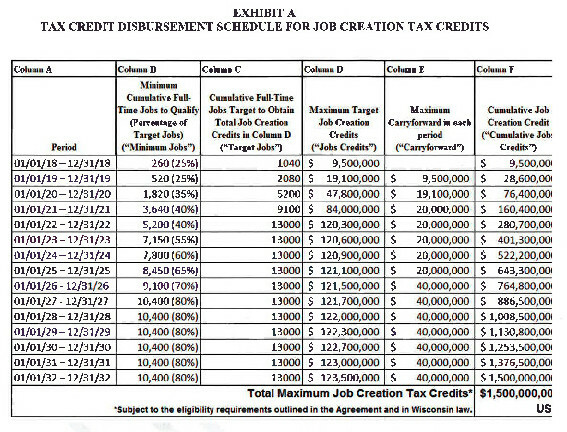 WEDC could not issue certifications to claim payroll tax credits under these provisions that total more than $1.50 billion. Bob Lang, “August 2017 Special Session Assembly Bill 1: Foxconn/Fiserv Legislation,” (8 August 2017) at 3. Notice that these “credits” are NOT based on actual work and pay for the previous year. Rather, they are based on who is on payroll in December for those employees who have been hired on a full-time basis (i.e., they will work 2080 hours), have benefits, and earn at least $22,620 for those 2080 hours they will possibly work. The state then returns to FoxConn in April of the next year 17% of these wages as calculated (not as actually paid). Note: So, there is NO accounting for employee turnover at FoxConn. Given the stories of worker suicides at FoxConn’s facilities in China, this loophole is staggering. Some of you may be asking about where is that $53,875 figure that was and is touted so much. Here is what is going on with that number. First, this number possibly includes the job benefits employees are receiving. Second, this number is only an average. Another provision of this deal caps the wages at issue at $100,000. So, the execs like Chairman Gou (who is also an employee of FoxConn Wisconsin) only have the first $100,000 of their salaries counted for these job subsidies. But, as noted above, that $100,000 figure will go a long way to making the average salary seem much higher than what is actually being paid to the other 259 employees needed to qualify for the subsidies. If there are 50 employees at $100,000 each and another 50 at $1,000 each, the average is $50,500. Moreover, understand that these job subsidies are only a small part of the package handed to FoxConn. For instance, Jake has some additional news about the land purchases and prep work going on right now on behalf of FoxConn ($60 million from FoxConn has been matched by $147 million from Wisconsin and Mount Pleasant). Given this FoxConn “deal,” it is not surprising that other companies are pushing for similar handouts. Kimberly-Clark asked for comparable job subsidies to keep two factories open, and has settled for a pro-rated financial handout to keep one factory open. And, that last part about “keeping” a factory open is the kicker. Wisconsin is essentially paying here to NOT lose jobs. As a result, manufacturing job growth in Wisconsin has been shoddy and continues to be so. DWD pushes gushing estimates about jobs in Wisconsin, but the actual numbers indicate Wisconsin is lagging behind all the mid-western states but Minnesota (a state with a growing economy, as Minnesota’s economy is not nearly as dependent on manufacturing as Wisconsin’s is). The problem now is that Wisconsin is committed to these corporate deals where the return is mostly to the benefit of the company. Profits may be soaring for these companies, but actual economic growth in the state and among the middle-class is flat-lining.